In this configuration tutorial I will show you how to configure a GRE tunnel between two Cisco IOS routers. One of the routers is located behind a Cisco ASA 5500 Firewall, so I will show you also how to pass GRE traffic through a Cisco ASA as well. As you might know already, GRE tunnel termination is not supported on Cisco ASA firewalls. However, this is fully supported on Cisco routers. GRE tunnels are not secure (no traffic encryption takes place through GRE (except if you run GRE over IPSEC). However, GRE tunnels are useful in cases where we need to pass “non-unicast” traffic between two remote sites (e.g through the Internet). Two scenarios that come to my mind now include passing routing protocols (such as OSPF) between two remote sites, and also passing multicast traffic through the GRE tunnel from one site to another. As shown from diagram above, we have two remote sites (LAN1 and LAN2) which we need to connect through the Internet via a GRE tunnel. The GRE tunnel will be terminated between routers R1 and R2. When configuring GRE, a virtual Layer3 “Tunnel Interface” must be created. The GRE tunnel will be running between the two Tunnel Interfaces (10.0.0.1 and 10.0.0.2 as shown from diagram). Also, the Tunnel Interfaces will be using as actual source IPs the addresses of the outside router interfaces (20.20.20.1 for R1 and 50.50.50.1 for R2). Therefore, IP routing reachability must be in place between 20.20.20.1 and 50.50.50.1. !Now configure GRE Tunnel Interface. Note that we reduce the MTU size in order to accommodate the extra headers added from the GRE protocol. Now let’s move on to configuring R2. That’s it for the routers. Let us see now how to configure the ASA. !Allow GRE traffic from R2 to R1. The ACL below is for ASA 8.3 and later. This is because from ASA version 8.3 and later, any access-list statement must reference a “Real IP” address and not a “Mapped” IP address. From versions prior to 8.3, the opposite was true. Now if you ping a host to LAN2 from LAN1 (and vica-versa) you should get ICMP replies. Please note also that I have not configured any security protection on the GRE tunnel. If you want you can configure IPSEC on top of GRE in order to encrypt all data passing through the GRE tunnel. See http://www.cisco.com/en/US/tech/tk827/tk369/technologies_white_paper09186a00800d6979.shtml for the complete discussion. Thanks a lot for stopping by and leaving your comment. I didn’t know that you don’t have to adjust the MTU for GRE. I know you have to adjust it for MPLS networks so I thought would be required here as well. Thanks for sharing your knowledge. How would the configuration look if you had an IPSec Tunnel between R2 and the ASA as well as the GRE between R2 and R1? Thank you. You would have two different tunnels, one for GRE (just like the one we describe here) plus the IPSEC tunnel. However, why would you want to do that? I would suggest using GRE with IPSEC protection between the routers instead of terminating a different IPSEC tunnel on the ASA. R2 supports IPsec and R1 does not and we need to run BGP to support a diverse route from the Primary WAN connection. Therefore, can you support GRE over IPsec on R2 and have the IPSec terminate on the ASA and the GRE terminate on R1 to support BGP? Thank you. I believe you can, although I haven’t tested it. You can have IPSEC between R2-ASA and the interesting traffic inside IPSEC must be GRE. So you would configure a VPN ACL on R2 and ASA which will allow GRE traffic to pass inside the IPSEC tunnel. This should work. Please can I config a GRE tunnel between ASA (5512-x) and a remote cisco router for Multicast traffic? Unfortunately Cisco ASA does not support GRE tunnel terminated on the device itself. 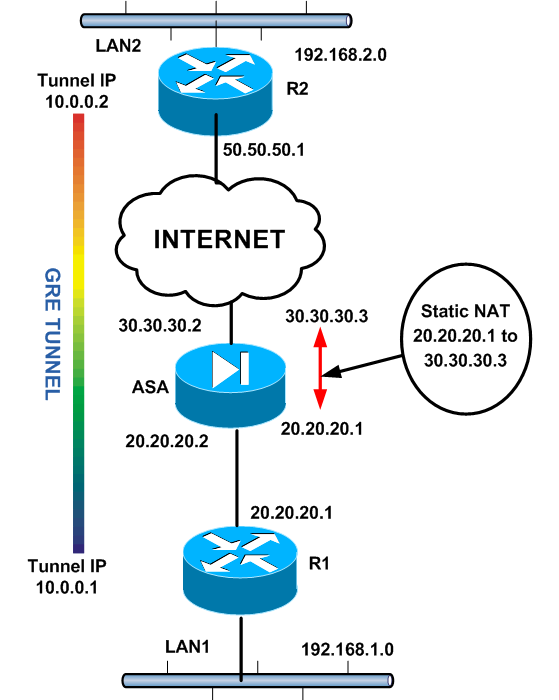 You can not configure a GRE tunnel between ASA and router. You need to have two routers. Thanks Song for your valuable comment. This set up works with IPSEC over GRE? Do you need to add anything ACL wise to make sure the GRE tunnel with IPSEC get passed through the firewall? Yes it will work with IPSEC over GRE as well. You will need to allow IPSEC protocols through the ASA outside ACL (ESP, AH, UDP 500). I am doing similar lab in GNS3. I can see traffic when I ping from inside to outside (Proto 47) but when I ping from outside to inside then I dont see any traffic on CISCO ASA. I have setup a capture on outside for gre and icmp. My ping is not working from inside to out or out to in. It looks like ASA is not seeing gre traffic when it comes back from outside. I have debug on outside router and when I ping from inside I can see that traffic arrives on outside routere. I fixed it. There was some error in config :). I wish you have mentioned IPsec for the same scenario because I am not able to implement it. The IPsec you mentioned above is for different scanrio. and again thanks for this config as it helped :).